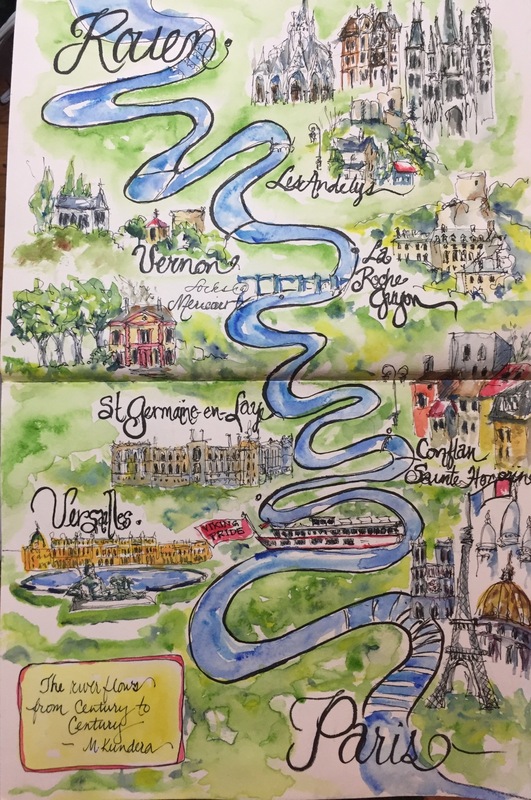 Another map of the places we went on our voyage down, or is it UP the Seine River. I guess we went both ways. Lol. Maps are a lot of fun and make a great memory for a travel journal. You should try one. First make a list of what u want to include. Sites restaurants places u stayed. Then make a rough draft of the roads or river you traveled. Use your photos to jog your memory. They are a lot of fun and your friends will love them. I used Carbon platinum ink on strathmore 50o mixed media paper. Love that ink and that paper. Inked with the carbon pen, a Kuretake brush pen for lettering and a Noodler Konrad. The river was inked with the Kuretake for emphasis. I drew the river with a pencil first but the rest was drawn straight on the paper with the carbon pen. Colors used cerulean cobalt Inathrodone blue burnt sienna burnt umber yellow ochre cad yellow cad red and alizarin. Oh and hookers green. Now go make a map! You’ve inspired me to make a map for my next vacation. I just need to plan that getaway… hmmm… where to go??? Vikings not a bad way to go. Though I have done them just of trips to the mountains too.